He was one of the competitors at this year’s Emerging Artist Showcase at the festival. After hearing his set at the festival, it’s not hard to tell why he was selected as one of the competitors this year. He has such a great stage presence, and such a fantastic voice. It’s an absolute pleasure to experience him on stage. We met up with Brad James at the end of his set backstage at the Silverado Stage. It was a little noisy, but that didn’t stop Scott and Brad from having a great time, and catching up. Watch the interview, and read the transcript below. SCOTT: Hey we’re on the front porch my name’s Scott Edwards, Brad James is with us, how’s it going? BRAD: Great I just finished playing, had two shows here at Boots & Hearts it’s been an awesome weekend so far, how are you? SCOTT: So good, so good. So you literally just got off stage, the Silverado stage how, and you were doing the emerging artist showcase earlier, what’s the crowd like here at Boots? BRAD: Crazy! Yah, it’s my first time here at Boots & Hearts, the sheer number of people and the organization of this whole thing is mind blowing. BRAD: It really is! It really, really is! I came back here last night for the Dallas Smith and Florida Georgia Line, FGL show and just the amount of people was mind blowing! It’s crazy! So, it’s so cool to be here opening it up, and hopefully to be back next year, fingers crossed! SCOTT: Knock on wood! So, what was your favourite thing about the show last night? BRAD: Uhh, Energy? The buzz, the view of the crowd, everything. It’s just one of the things that drives us, right? It’s like you see that, and it makes it a goal to do stuff like that. I mean I’m lucky that I played to the Front Porch, and the Silverado Stage, but over to the main stage as well. SCOTT: When Florida Georgia Line’s up there performing, do you, like envision yourself up there beside them, or do you just see yourself up on that stage? BRAD: Uh, Yah. Just my own personal vision of me and my band and us playing up there and rocking out. SCOTT: And what’s does that look like? BRAD: It’s pretty damn cool. I Cannot lie. SCOTT: So we were taking earlier you’ve put out a single called “All Day Long” a great tune, “Whiskey” we know and love already. What are we going to hear from you in the future? BRAD: Funny you should ask! We are actually dropping a song called “I Love the Way You Drink” on August 27th so I’m looking forward to that. It’s pretty self-evident from what the title is, so I hope you guys will hear it soon, and I hope you like it. BRAD: Yep, the website is BradJamesMusic.com check me out there, my dates are all there, bio, features, all that stuff, and the usual suspects for social media, Twitter and all that stuff. SCOTT: Will we see you at the CCMAs this Fall? BRAD: I live that close! So, it’s a lot better than flying to wherever. SCOTT: They’re in Hamilton this year, right? SCOTT: Brad James with us on the Front Porch under the Silverado Stage, I got to say this is the nicest front porch we’ve been in, so thank you! BRAD: Yah, a place to keep cool! SCOTT: Yah totally, thanks so much for tuning in! Brad works and lives as a full time musician in the Hamilton area. He has been “paying his dues” at a punishing rate of over 200 shows a year. Brad is ready to go to the next level and it looks like 2018 is the year of the next step as he continually writes, and records new material with many of Canada’s biggest names. His brand new album produced by CCMA Producer of the year Carly McKillip is due to be released in the next few weeks. Brad wrote or co-wrote half the album. 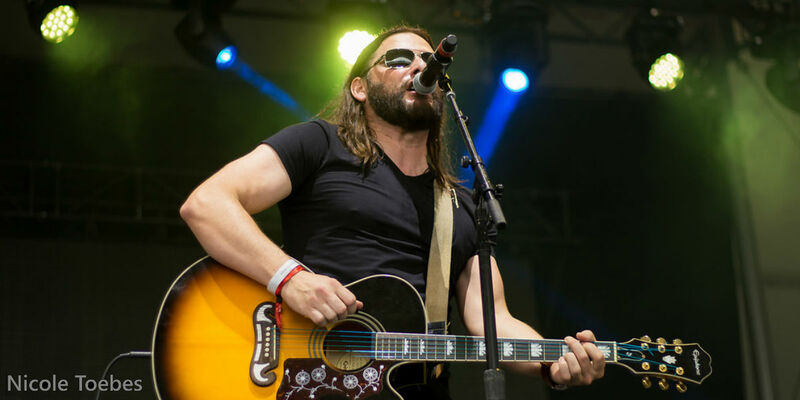 He has opened for artists such as Terri Clark, Road Hammers, Aaron Pritchett, Big and Rich, Emerson Drive, Chad Brownlee, Jess Moskaluke and Tim Hicks. Brad has his current single at radio called “All Day Long”. It’s available on iTunes, Spotify and Google Play.